(Nanowerk News) In the quest to reduce the costs of solar cells to increase the use of solar energy, scientists are focusing on the use of cheap thin films rather than thick wafers of silicon. However, light absorption in thin films is often poor, which limits the minimum thickness of a film. Researchers from the Institute of High Performance Computing of A*STAR, Singapore, in collaboration with co-workers from CSIRO Materials Science and Engineering, Australia, have now revealed how metallic nanostructures can enhance light absorption—even in very thin silicon films—and thus increase the performance of thin-film solar cells ("Surface Plasmon Enhancement of Optical Absorption in Thin-Film Silicon Solar Cells" and "Enhancement of optical absorption in thin-film solar cells through the excitation of higher-order nanoparticle plasmon modes"). Silicon thin films are particularly poor at absorbing infrared light, which means a broad range of incoming solar light is squandered. New methods are required to overcome this fundamental problem, points out Yuriy Akimov, who led the research team. In the past few years, adding small metallic nanostructures to the films, such as silver nanoparticles, has been proposed as a means to enhance their efficiency. The nanoparticles act like tiny mirrors, but they concentrate light much more strongly than conventional mirrors. The effect is based on surface plasmons—the collective motions of electrons at the nanoparticle surface—that intensify the incoming light and focus it into the silicon layer (Fig. 1), which significantly improves light absorption. Although other researchers observed this effect previously, what has been lacking is a detailed understanding of the influence of parameters such as nanoparticle diameter and surface coverage. Akimov and his co-workers therefore simulated solar cell performance for a broad range of a number of nanoparticle parameters. Although it proved difficult to optimize all parameters simultaneously, a clear range of suitable nanoparticle properties emerged. For example, they found that the nanoparticle surface coverage required for sufficient enhancement of a thin film can be as small as a few percent of the total area. Overall, projected enhancements in light absorption can reach about 30% compared to the same solar cell without nanoparticles. “Nanoparticle-enhanced solar cells use quite complex phenomena and require optimization studies for many parameters,” says Akimov. Plasmonic enhancements are very sensitive to nanoparticle shape, so structures other than spheres could enhance absorption even further. Similarly, the combined use of different metals could also lead to enhancements over a broad range of wavelengths. 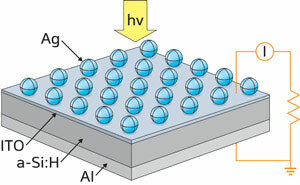 Improved solar cells are therefore expected from the further optimization of metallic nanostructures. Indeed, we may soon be able to buy solar cells based on enhanced light emission facilitated by surface plasmons.